Before I could fly though, I had to get to the airport. O’Hare, as I noted in the first part of this Travel Spot, has good connections to the city centre, making it an easy airport for get to/from, once you’ve worked out where the Blue Line station is. Getting to the airport from the city is even easier, since you are deposited in the heart of the airport, although you do have to allow some extra time to get the transit from Terminal 2 or 3 to Terminal 5 if you’re flying with a non-US airline such as British Airways. However, I wasn’t in the city centre. I was out in the suburbs with my friends, which made it even easier since they gave me a ride to O’Hare. It’s a trip I’ve made a few times before, but this was the first time I’ve really paid attention. O’Hare as a really bizarre traffic system, where to get to Terminal 5, which is off to one side of the main airport, you first have to drive around past Terminals 1, 2 and 3 and then back out right next to the road you came in on before swinging off to Terminal 5. Quite why no-one has put a short ramp from one side of the road to the other I don’t know since I suspect a lot of the traffic clogging the roads around Terminals 1, 2 and 3 is heading for Terminal 5. Removing that traffic would make everyone’s lives easier! For once in my life, I arrived at the airport ridiculously early. I’d booked the later of the two British Airways flights which departed at 20:55, ideal as far as I was concerned since it meant that I’d be ready to sleep an hour or two after we took off. Normally, for a flight like this, I’m cutting it fine, arriving at the airport around 19:00, but this time, because my friend who was giving me a ride had to get back for a parents’ evening, I was at check-in just before 17:00. Even, so it was probably just as well since it took us an hour to cover the 21 miles to O’Hare and that was before the Thursday evening rush-hour traffic kicked in. I’ve written before about why Terminal 5 is my favourite at O’Hare and my experience on this trip reinforced that opinion. I arrived at just before 17:00 and was checked in by 17:05, which included, for the first time in my life, checking in three bags (I had some things to bring back from my friends in Chicago and thought I may was well make the most of the extra baggage allowance afforded by First Class). There were no queues at check in, so being able to use the First Class desk didn’t really help. I note, by the way, that British Airways has got things right at O’Hare. Either it has influence with the powers that be, or, more likely, paid a lot of money, but whereas at some airports, British Airways can feel like a forgotten cousin, tucked away in some far corner of the terminal, here the check-in desks were right next to security, while the lounges and gates were pretty much dead ahead on the other side. Going through security was a breeze, helped by being able to use the priority lane for passport control, after which I joined the general line for security. I’ve never had a problem at Terminal 5, but when I’ve flown from the other terminals at O’Hare, either flying internally or when I flew back with United and American last year, it’s taken me up to an hour to get through security. As ever, I think the majority of my time was spent taking things out of my bags, putting them into trays (I used three in all and remembered to put my bag through first again) and then packing them back into my bags afterwards. Even so, by 17:15, I was at the gate, with three hours to kill. I’ve been visiting Chicago for over 15 years. I remember O’Hare’s Terminal 5 from back then, when it was a real desert once you got past security, just a few chairs where you could wait and practically nothing else, certainly no shops or restaurants. All that has changed over the years and now O’Hare has joined the ranks of modern airports, with duty free shopping, bars, cafes and restaurants, all vying for your attention (and your money). It also has something other airports could learn from (Phoenix Sky Harbor, I’m looking at you), an airside mailbox. Not that shops and cafes mattered much to me since, just like the last time I flew from Terminal 5, almost exactly a year ago, I was in the lounges, only that time I was in the Club World lounge. This time, I was one up, in the First Class lounge, tucked away behind a rather modest door on the other side of the concourse. Unlike my recent experiences in Bangkok and Tokyo, where the lounges have been shared with other airlines, both these are dedicated British Airways lounges and, once again, British Airways was doing something right since they were both right next to the gate. The lounge itself wasn’t that different from the Club World lounge, although tucked away between Gates M11 and M12, it had excellent views out across the tarmac towards the runway, which is ideal if you like watching the planes taking off, landing and taxiing around. Its small size gave it an intimate feel compared to the much larger Club World lounge and it was much quieter. There was a small lobby, with drinks, plus snacks off to the right, while off to the left, a row of comfortable seats in sets of four, facing each other across a coffee table, ran along the windows at the front between M11 and M12. If you didn’t want to watch the planes, then there was also a pair of computer terminals off to the right. There was a selection of food, the usual lounge fare of soups, sandwiches, cheese and biscuits, plus a wide range of drinks. I didn’t risk the coffee, but did treat myself to cheese and biscuits while I amused myself for an hour and half, alternatively writing postcards and watching the aircraft come and go. By then it was almost 19:00 and the sun had gone down, so I decided to have dinner. Normally, I’d eat on the plane, but I really wanted to get some sleep on the flight, which is under eight hours long, so I figured that if I ate before flying, it would leave more time for sleeping. Other than the snacks, there was no food in the lounge. Instead we were told that we could go across to the Club World lounge for dinner. I’d assumed that this would be in the restaurant part of the lounge where I’d gone the year before, but instead I was shown into a private dining room, a really exclusive affair. This had seven two-person tables, five on one side, two on the other, a dedicated waiter and a four-course menu, with all the dishes cooked to order. Talk about being spoiled! I really hadn’t expect this, but made the most of it, ordering a pear salad to start with, followed by pan-roasted Arctic Char and a passionfruit custard dessert, all of which were excellent. I decided to skip the cheese and biscuits though. In all, I was there for 1¼ hours. I returned to the First Class lounge at 20:00 to wait for my flight to board: rarely has three hours flown by so quickly! This time the lounge was almost full, whereas when I had left for dinner, there had been maybe 10 people in here. The plane, an Airbus A380-800, had also arrived while I was away. You don’t really get a feel of how massive these planes are until you see them at the gate, or next to other aircraft, but they are huge! I really don’t understand people though. My flight was due to leave at 20:55, and even though lounge staff told us they’d call us when the flight was ready to board, people kept leaving to go to the gate. By 20:25, when we were called to board, maybe three quarters of them had already left the lounge. I was one of the last to leave the lounge, although when I got to the gate (admittedly just a minute’s walk) the boarding still hadn’t begun. There was another five minutes of hanging around before we actually started boarding, beginning with First Class. Despite several calls for everyone else to sit down and wait to be called, I still had to make my way through the usual scrum of people before I could board the plane. 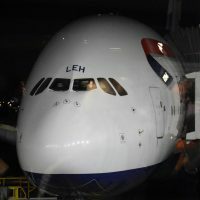 The A380 is such a large plane that both gates, M11 and M10, were used together as a pair, boarding the lower deck though M11 (on the left) and the upper deck through M10 (on the right). This meant I was heading off to the left, First Class occupying a small section right at the front of the plane on the lower deck (that was my only regret in travelling First Class; for some reason, just as I always want to sit upstairs on double-decker buses and trains, I always want to sit upstairs on the A380). Although the Airbus A380-800 is a huge plane, the First Class section is relatively small, with just 14 suites (as the seats are called) tucked away in the nose. In contrast, there are a total of 97 Club World seats, spread over two cabins, a smaller one behind First Class, and a larger one on the upper deck. The seats in First Class are arranged in three rows of four suites (one by each window and two in the middle, all facing forward) while, right the front, there’s one on either side of a central staircase leading up to Club World. To give you an idea of the layout, take a look at the Seat Guru page for the British Airways A380. There’s a double galley is at the back, between First Class and Club World, with the front part of the galley serving First Class and the rear part Club World. Forward of First Class, other than giving access to the cockpit and the stairs, there’s just a pair of toilets. I’m used to this area holding a galley on smaller planes and it was a pleasant surprise to find a big, open space that I could wander around in, something you don’t often get on a plane! I was onboard and at my seat by 20:35. I was booked into Suite 3A, which was in the middle of the three rows, on the left, by the window. However, after I’d settled in, a couple boarded, sitting in 3D (the aisle suite to the right) and 4A (directly behind me) so I offered to swap. Not long after that, at roughly 20:55 (ie our scheduled departure time), boarding was complete, although we didn’t push back until 21:10 and there were another 15 minutes of taxiing before the crew were told to take their seats for take-off. Finally, at 21:35, we took off, heading west. You can see what I made of my seat (and First Class in general) after the gallery. I’ll be honest. I’ve spent 20 years flying in the back of plane, so moving up to business class/Club World was more than enough in terms of what I need on a flight, the major boon being the lie-flat bed so that I can sleep on overnight flights. However, as nice as Club World is, First Class is a completely different level, both in terms of the space the seats off and in terms of the service. It really is awesome. Just to give you an idea, in Club World, the layout on an A380-800 is 2-4-2, while in First Class, it’s 1-2-1, so each First Class suite takes the up the width of two Club World seats, and it shows. Whereas the standard Club World seats on British Airways flights are aligned along the length of the aircraft, the First Class suites have the seat at 30⁰, more like the American Airlines business class pod I had on my flight to Chicago. However, those seats are staggered, so there’s limited space to either side: in First Class, the entire space is yours, so there’s so much space around the seat and even more leg room. Ahead of me to the right, there’s a triangular space about a metre high. This is a cupboard, opening onto the aisle, complete with coat hanger and shelf where you can store things as an alternative to the overhead locker. To give you an idea of how large it was, I managed to get all my hand baggage in there, which is just as well since the central section doesn’t have overhead lockers, so without the cupboards, both seats would have to share the one overhead locker that was above my seat. On the other hand, the overhead locker was huge, so I doubt it would actually have been a problem. To my left, another triangular area has a sunken storage area as well as the power outlets. It’s pretty big though and I used it to store all my coffee kit and my camera. Compared to any business class/Club World seat I’ve ever flown in, that’s a huge amount of easily accessible space. Ahead of that is a podium containing the seat controls in a front panel and a massive fold-out table. Even better, it acts as a little side table with or without the table folded out. Finally, there’s what amounts to a shelf that runs around pretty much the whole seat, even at the far end where there’s a small foot stool. Unlike the fold-down foot stools in Club World, which you can’t sit on without breaking them, or the American Airlines business class configuration, where it narrows to a point, in First Class you can sit actually sit at the other end of your seat, which is surprisingly useful! The table, by the way, is easily the biggest and most stable I’ve ever used on a plane, folding out to over twice the size of my laptop. Even better, it can slide a long way towards you, so that it’s conveniently placed for typing, but in its natural position, it leaves plenty of space so you can get in and out of your seating without having to fold the table away (which, in fairness, is also the case in Club World). I really was blown away by having so much space and was surprised by how much difference it made to the simple things, like getting in and out of the seat. It’s also a bonus that every seat has direct access to the aisle rather than having to climb over someone (or be the someone who is climbed over). The final touches were two well-spaced and well-placed windows, a proper light with a light shade and a massive fold out TV screen, which was also incredibly clear. Naturally I was confused by the multitude of seat controls, but having played around, I found a few simple controls. A single, rotary nob moves the chair back/up (clockwise) and down/forwards (anti-clockwise), while below that is a button to return the seat to its landing/take-off position. There’s also a simple dimmer switch for the light, which was far less harsh than any at-seat light I’ve had before. So that’s the seat. However, the other major upgrade is the service, which you can read about after the gallery. The service in First Class starts when you get to the door. Instead of being told where you seat is, the cabin crew actually take you there. You also get your own, named flight attendant (in my case, Emily, who was excellent, although British Airways crew generally are some of the best). Just as in Club World, you are offered a welcome drink. I asked if the espresso machine was one and Emily said if it wasn’t she’d turn it on for me, so I ordered an espresso, another perk of flying First Class. My one regret was that I didn’t get a chance to have a look at the espresso machine itself: it was a short flight, the galley was perpetually busy, and I didn’t want to get in the way, nosing around with my camera. My espresso arrived shortly afterwards and while it wasn’t the most photogenic in the world, it was pretty damn good, the Union Hand-roasted beans really coming through. It was well-balanced, well-rounded, and with no bitterness, every bit as good as the best of the Union espressos I’d had in the lounges up to that point, maybe even better. We took off at 21:35, forty minutes late, and the seat-belt signs went off at 21:45. The original flight time had been 7¾ hours, but the pilot came on to say that the flight should only take 6¾ hours, so we’d hardly be late. The only downside was it meant that I’d have less time to sleep, making me doubly glad that I’d eaten before boarding the plane. I didn’t want to miss out entirely though, so I ordered hot chocolate and cookies, plus a glass of port, a Warre’s 2000 colheita, a big step up in quality compared to the port available in Club World. The flight went pretty quickly: we were across Lake Michigan in 15 minutes and heading out towards Ann Arbor and Detroit. We crossed over the Canadian border at 22:10, just before my hot chocolate, cookies and port arrived, which were excellent, particularly the cookies which were hot, rich, but not sickly and the port, which I’m definitely having again (if I fly First Class, that is)! Less than an hour into the flight, at 22:25, we’d reached Toronto and were heading along Lake Ontario. At this point, there was less than six hours of the flight remaining and I was wondering if it was worth going to bed! You can see what I decided after the gallery. Another subtle difference in First Class is that the cabin crew come through and tell you in person about updates to the flight times rather than relying on announcements from the flight deck. In this case, we were told that we were taking good progress, and would be arriving at Heathrow early at 10:10, but we would probably asked to hold before landing due to strong winds at Heathrow which were reducing the airport’s landing capacity. That decided it for me. It was 22:40, we’d just left the north shore of Lake Ontario behind and were going to be at Heathrow in 5½ hours’ time. If I was going to get any sleep on the flight it was now or never. Another difference between First Class and Club World is that you get a sleep suit if you want one (pyjamas to you and me). I’d had one of these when flying back from Shanghai in business class with China Eastern, but I’d never had one when flying with anyone else. In Club World, when you get to your seat, you’ll find a pillow and a large box with a blanket/duvet. In First Class, the bedding is nowhere to be seen: when it’s time to go to sleep, the cabin crew come and make up the bed for you, including a separate base sheet, plus a blanket and pillow. When I fly business/Club Class, I tend to sleep in my clothes, just because there’s nowhere to put my stuff, but here, with so much space, I decided to change into the sleep suit. The bed itself was really comfortable and, being a little bit longer (6’6” rather than 6’) I could easily lie flat. I got ready for bed just as we were approaching Montréal, ironically my destination in exactly two weeks’ time. By now there was under 5½ hours’ flying time left. When I went to bed, at 22:50, the cabin lights were still up and, although I drifted off easily enough, I woke up again at midnight, when the cabin lights had been dimmed for the night. Sadly I found that the noise from the galley (which was right behind me) was preventing me from getting to sleep (the only disadvantage from swapping seats) so I popped in my earplugs and managed to quickly drop off again. Although I’d asked to be woken for breakfast, I actually woke up naturally at 03:00, 09:00 UK time, as we approached the coast of Ireland. By now we were only about an hour from Heathrow, so I got up, got dressed and was back at my seat by 09:15, just in time for breakfast. I missed out on the First Class service for dinner, but I got the full treatment at breakfast, which started with my table being laid, complete with table cloth. The last time this happened to me on a plane was when I flew in business class with China Eastern. Breakfast arrived at 09:25, just as we crossed over coast of Ireland, with a first course of fruit, bread rolls and pastries. At the same time, there was an update on our scheduled landing time, pushing it back to 10:20, which meant that there was just under an hour to go. It took us just over 10 minutes to fly across Ireland, at which point the rest of my breakfast arrived: scrambled eggs, potato cakes, mushrooms, asparagus and tomatoes. This was lovely, probably the best airborne breakfast yet. I’d finished and everything was cleared away by 09:45, just as we crossed the South Wales coast. I ordered an espresso after the meal. I braced myself, suspecting that it wasn’t going to be as good as the one I’d had before take-off. There are several reasons for this, all to do with the environment inside the plane. Airlines keep their aircraft pressurised to the equivalent of an altitude of 8,000 feet, which is about 75% of air pressure at sea level. As a result, water boils at just 92⁰C (an issue I encountered in Flagstaff, which is at that altitude), which complicates the business of making espresso (and coffee in general). The environment also dulls the palate, so things literally taste different in the air. Unsurprisingly, my second espresso was nowhere near as good as the first, although, in fairness, it was still pretty drinkable. The pilot announced that we were 20 minutes to landing at 10:10. We flew south of the airport, passing just north of my home in Guildford, then turned south in a tight clockwise loop to use up some time, taking us east of Guildford before we resumed our easterly course over south London. We turned around at the Thames Barrier, adopting a standard approach over central London, which ironically meant that we were heading back the way we had come. The few times I’ve had a window seat on the approach to Heathrow, I’ve been on the right-hand side of the plane, but this time I was on the left, so had some different views for once,. We landed at 10:35 and were at the gate by 10:40, back in my old friend, the C Gate block. I hopped on the transit to the main arrivals area and by 11:00 was at passport control. Five minutes later, I was waiting by the carousel and, twenty minutes later, I was reunited with my bags (all three of them). And that was pretty much that. This entry was posted in Brian's Travel Spot, Chicago and tagged A380, BritishAirways, Chicago2018T2, FirstClass by Brian Williams. Bookmark the permalink.